The black card is available for managerial occupations and is a replacement of the previously known 'Platinum card'. 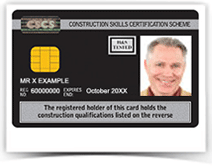 Achievement of an NVQ or SVQ Level 4, 5, 6 or 7 is required to apply for this CSCS card. Please note that there are specific revision materials for this test. To buy revision material please click here. All applicants must pass the CITB Managers and Professionals Health, Safety & Environment Test. To book the test please click here. From 1st August 2009, all cards that previously required applicants to pass the Professionally Qualified Persons test (PQP and Managers cards) will now need to take the Managerial and Professional test (MAP). Individuals who have taken the PQP test prior to 1st August 2009 will still be eligible to apply for a PQP, Manager or lower level card within two years of passing the test.